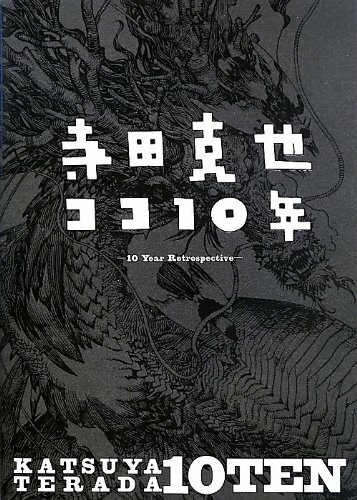 KATSUYA TERADA 10 TEN is actually the catalog for Terada's solo exhibition of the same name at Kyoto International Manga Museum. The exhibition runs from 16 Mar to 30 Jun 2013. It's a 328-page paperback with a dust jacket. The book is small A5 size which is quite a bummer considering many of his works are quite detailed, especially the line art. As the book title suggest, it collects art works from the past decades. There are illustrations, sketches, comic panels, commission works and other personal doodles. Stuff from his Monkey God series, Marvel fan art or commission work, illustrations for other publications, some rather explicit pin-ups and more. Majority of the works are printed in grayscale or duotone. Only selected pages are in colours. The book feels like a sketchbook because of the lack of colours, and there are lots of sketches too. I've seen many of his illustrations in colour such as those from his coverage of the Giro d'Italia 2007 cycling competition. Colours would have made the book more awesome, but well, it's a catalog and not too expensive. While the book is in Japanese, publisher PIE Books has provided English translation on their website for the pages with text. Great book to check out if you like Katsuya Terada or sketchbooks. That's the English translated interview of Katsuya Terada. It's behind the dust jacket. A close up on the cover without the dust jacket. Looks like an English version is being published in July! available to pre-order on amazon.com/uk.